Hache is a family friendly restaurant that prides itself with its quality service, stylish decor and award winning burgers. Sit in sociable and intimate surroundings and enjoy the delicious selections if imaginative burgers on offer. Definitely the best burgers in London. They grind their own beef fresh and its always tasty and fresh. The menu has a wide selection of burgers and different toppings. The milk shakes are also delicious! Best burgers in London. Great selection. By far my favorite place for a casual yet great tasting meal! Great service and one of the best burgers I've ever eaten! Loved it! Have been using restaurant review sites for quite a while now but only recently realised that I'm constantly taking and not giving back to other users! 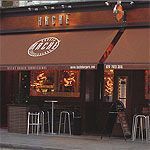 I've been going to Hache on Fulham Road for many months now and it is one of the most consistently good restaurants made even better by its value. I love a good burger, one that is full of flavour, not over seasoned, cooked just right (rare for me) and with a huge choice of toppings from goats cheese to a fried egg or mushrooms and peppers. Not once have I been disappointed with the food. OK, it's not Daniel Boulud good when compared to his out of this world foie gras burger, but for one third the cost you can't argue with it. And the fact it is on a different planet compared to the insipid dry excuse of a beef burger at Sophie's Steakhouse just a few doors down just seals the deal for me. The service can be a bit hit and miss – they have good days and then other days when you wonder if they've woken up at all. But always friendly which is nice. Love it.